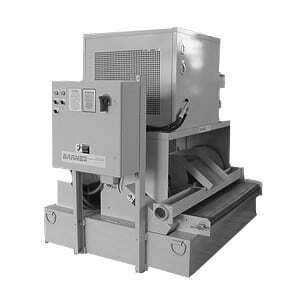 Magnetic and Fabric Filter with Chiller (RMP) - Barnes International, Inc.
Barnes Immersed Drum Fabric Media Systems provide simple, efficient and reliable high quality machine tool coolant filtration for honing machines, grinders, milling and broaching machines. This filter was designed for easy maintenance, long life and economical operation. The Magnetic and Fabric Coolant Filter is available in six different sizes to accommodate flow rates from 5 to 100 gpm. Coolant Cooler and Filtration Unit saves on floor space and reduces both maintenance and housekeeping costs. Installation Simplified with Compact Design. May be used on Ferrous or Non Ferrous applications. Coolant filtration is accomplished through the natural force of gravity. Efficient use of the filter fabric is assured by advancing the fabric only after the coolant flow is blocked and then, only enough to restore the flow rate.